WRITING UPDATE: THIRD SHORT STORY (CHAPTER 5)!!! I have reached the fifth chapter of my third short story. This section of the plot will explore both the past and the present. In the past, the technological advancements instigated by the existence of neohumans will be explored in addition to what kind of society they would have and how that would affect the human colonies surrounding them. In the present, Vogan continues to spend his free time only to find out how crime syndicates would take advantage of the sudden increase in the neohuman population as a result of volume three. In both time periods, the reader will acquire a better understanding of what drives Vogan and what he plans to do in future volumes. WRITING UPDATE: THIRD SHORT STORY (CHAPTER 4)!!! I am getting close to finishing the fourth chapter of my third short story and this is where the plot starts to get intense. In essence, a game-changing event transpires that creates conflicting opinions about Vogan and those close to him. In future chapters, the consequences and aftermath of this event will be further elaborated. Also, there will be a few hints as to what Vogan’s master plan will entail. There will be tragedy and betrayal within this chapter along with a foreshadow of the villain Vogan will become. I am looking forward to writing this short story even more and I will keep you updated. 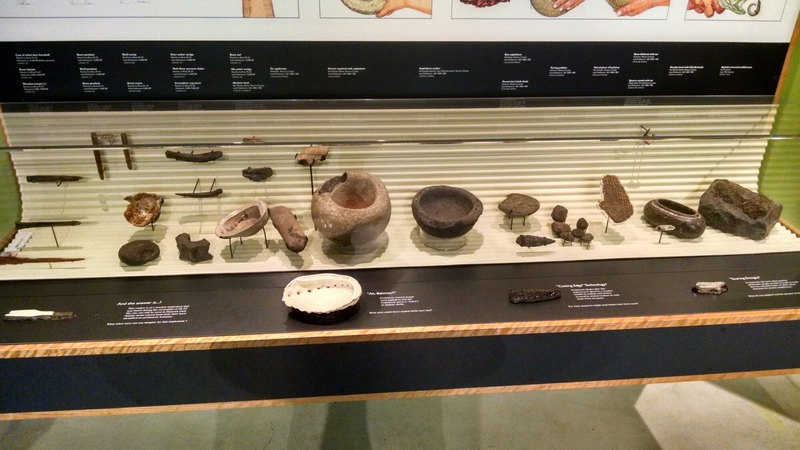 While I was at the La Brea Tar Pits, I found some artifacts that were exhumed from the tar pits. Upon examining these items, I got a clearer picture of what kind of culture Vogan was born into while brainstorming on what to include in my third short story. However, even though these tools depict how primitive this society was, Vogan’s immense powers will instigate an advance in technology, resulting in a slightly more sophisticated civilization. What form these technological advancements will take will be quite surprising. One of the most iconic Ice Age creatures is the wooly mammoth. Thousands of years ago, this animal could be found in Europe, Siberia, and North America. 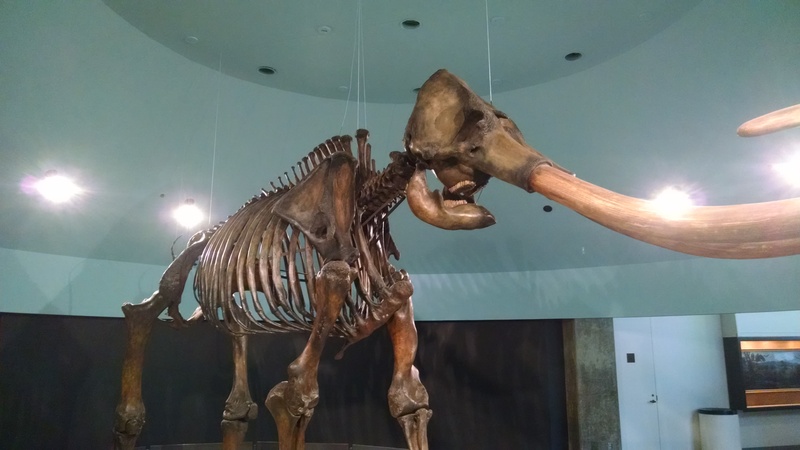 This particular specimen was one of the many fossils I encountered during my visit to the La Brea Tar Pits. When it was alive, this animal weighed about seven and a half tons. The mammoth has been one of the favorite prey items of ancient man, which may have been one of the reasons for its extinction. However, ancient man, mere mortals, hunted mammoths with spears and other primitive weapons. If Vogan, a neohuman who wields power beyond reason, were to hunt a mammoth like the rest of his tribe, what methods would he utilize? That is a question I have been asking myself as I continue to write my third short story. Imagine if the most powerful neohuman ever to exist confronted seven and a half tons of muscle and rage. That would be a serious clash of the titans. As I continue to write my third short story, I seek out more inspiration and information in order to better understand the world Vogan was born in. 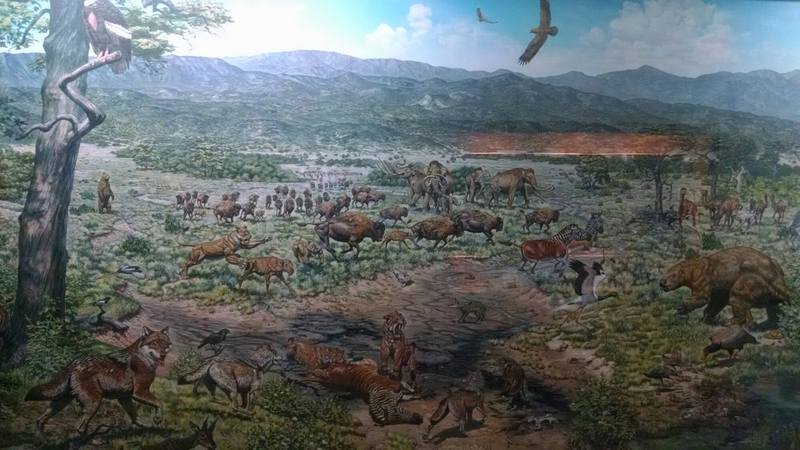 I visited the La Brea Tar Pits today and I have gained considerable insight. Here is an artist’s view of the Pleistocene, which was the era the main villain of my series, Vogan, was born. WRITING UPDATE: THIRD SHORT STORY (CHAPTER 3)!!! I have started the third chapter of my third short story and I must say that I have been looking forward to writing this particular chapter for some time now. The reason for this is because it will demonstrate what Vogan does during his free time when he is not running his syndicate. I have gained inspiration for Vogan’s extracurricular activities from my passion of culture and the arts. In addition, the end of the previous chapter will give a glimpse at what Vogan’s master plan will include. In future chapters, it will be revealed that Vogan came up with this master plan through the most unexpected of ways. Just as a warning, Vogan’s descent into madness will be very graphic and dark. WRITING UPDATE: MY SERIES EVOLVES!!! When I first started my series, I thought it was just going to include five novels. However, in recent years, it has come to my attention that my series is growing far beyond my five main volumes and will include numerous other stories that further explore the Young Guardians world. What started out as a series that was limited to a certain number of volumes is rapidly evolving into my very own superhero universe. In other words, I am doing all by myself what took companies such as DC Comics and Marvel Comics years and entire teams of people to create. It is a huge task to undertake, but I think the end results will be rewarding. Wish me luck!